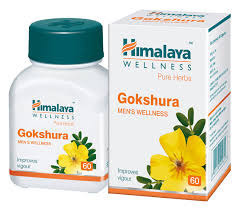 Leading Wholesale Trader of himalaya gasex tablets, himalaya herbals - triphala 60 tablets - new, himalaya herbals yashtimadhu 60 tablets, himalaya herbals tulasi (holy basil) 60 tablets, himalaya herbals trikatu 60 tablets and himalaya herbals tagara 60 tablets from Mumbai. Dose Please consult your physician to prescribe the dosage that best suits the condition. Gasex Tablet renormalizes the intestinal transit time. Gasex tablet has prebiotic, antiflatulent and antacid, antiulcer, anti-inflammatory, hepatoprotective, cholagogue and membrane-modulating, antimicrobial, and antioxidant actions. 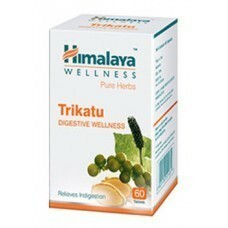 Himalaya Triphala is a combination of 3 natural fruits: Amalaki, Haritaki and Bhitaki which all three are widely used in ayurvedic preparations. 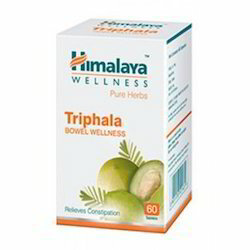 Triphala cleanses the colon and the digestive tract and helps relieve long-standing constipation. It is an effective antioxidant and supports normal detoxification of the bowel. It purifies the blood, detoxifies the liver and promotes normal serum cholesterol. Due to its purifying action Himalaya Triphala is an excellent remedy that prevents premature ageing, strengthens the immune system and promotes normal blood presure. Triphala also promotes healthy eyesight. Natural products treat not just the symptoms but the body as a whole and take time for absorption and results. 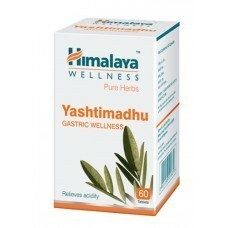 The root of Yashtimadhu is used in traditional ayurvedic medicine as a drug for strengthening muscle and bone, for increasing physical strength and for treating peptic ulcer. Scientific studies have shown that a glycosoid helps to treat gastric, duodenal and esophageal ulceration or inflammation, heartburn and mouth ulcers. The demulcent and anti-ulcerogenic action of Yashtimadhu is beneficial in gastric and duodenal ulcers. 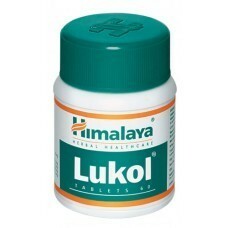 It promotes healing of ulcers. 1 Tablet twice a day before meals. 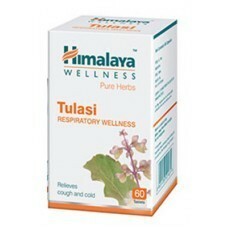 In Ayurveda Tulsi (Holy Basil) is used since ancient times for the treatment of cold and cough. With its antibacterial, antiviral and antifungal properties it is very beneficial in seasonal cold and recurrent respiratory infections. It contains phytonutrients such as eugenol linalool, ursolic acid, calcium, vitamin C, carotene, phosphates which are excellent antioxidants and help to reduce stress and stress related diseases. Tulsi supports normal blood sugar level, normal liver function and strengthens the immune system. Trikatu is an anti-mucus and digestive powder used to improve gastric and respiratory function. It is useful in cases of obesity, weak digestion, high cholesterol, high triglycerides, hypothyroid, slow metabolism, congestion, cough, and edema. Trikatu is a safe digestive stimulant and expectorant. It is antiallergenic, carminative, antiflatulent, and acts as a natural antihistamine. Effective in dyspepsia, it provides a balanced heat to warm digestion and circulation and to prevent the formation of gastric mucosa. Trikatu is used internally in the treatment of gastric and abdominal disorders, asthma, bronchitis, coughs, dysentery, pyrexia, and insomnia. 1 Tablet twice a day after meals. 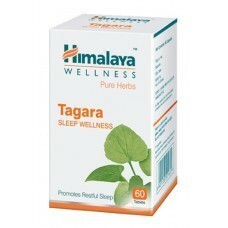 Valerian also known as Tagara is available as a pure herb extract from Himalaya Herbals. Valerian has even been mentioned in ancient Greek literature for promoting healthy sleep. Valerian is calming and reduces anxiety and stress of daily life. It helps to soothe and relax and supports restful sleep. Valerian has over 120 chemical components. The valepotriates and the isovaleric acid are supposed to promote healthy sleep patterns. The valepotriates have a salutary effect on the autonomic nervous system; research suggests that they have a calming effect on agitated people but are also a stimulant in cases of occasional fatigue. Shallaki (Boswellia Serrata) is an Indian herb with a rich tradition in the ancient health system of Ayurveda. All over the world, people rely on Boswellia to help them lead healthy. Shallaki (Boswellia isprimarily) used to nourish the joints, promoting healthy function foreasy, worry-free activity.Its oleo-gum-resin is fragrant, transparent and brownish yellow in color and has powerful anti-inflammatory properties thatt have been proved though clinical research. It is also found to be anti-fungal, analgesic, anti-bacterial, and . Boswellia Serratta is mostly used for prevention of improving appetite, rheumatic disorders and helping in general weakness. Parts used: gum and Bark. 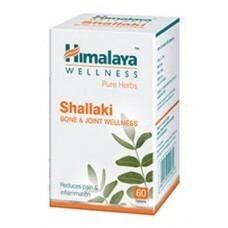 - Shallaki helps in relieving pain, as vata is cause behind each pain. - It works as anti inflammatory substance which is useful in curbing any kind of pain and swelling due to presence of boswellic acid. - It is indicated in arthritic problems like osteoarthritis, rheumatoid arthritis, gout, joint pains and skeletal muscle pain. - It is also indicated in back pain and lymphadenopathy. Neem is useful as a tonic and astringent that supports the body's - natural wound healing abilities. 1 or 2 tablet twice a day with meals. Allow several weeks for long lasting benefits. Natural products have a wholistic effect on the body and take time for absorption and results. Hadjot is called in Sanskrit Asthisamharaka and this means literally 'protecting bones from destruction'. In Ayurveda it is used since 5000 years for its potent fracture healing properties. Hadjod contains triterpenoids, β-sitosterol, quadrangularins A, B and C, and calcium which help in healing fractures and early ossification (bone formation). 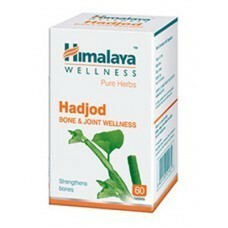 Hadjot stimulates bone metabolism and increases the uptake of minerals like calcium, phoshorus, sulfur and strontium. This is helpful to prevent osteoporosis and osteoporosis-related fractures. It relieves pain and inflammation associated with bone fractures. The chromatograph is representative of the quality and consistency of the drug. Every single capsule of Himalaya Pure Herbs has identical chromatographs, indicative of highest standards of quality maintained by Himalaya. The pure herb bought by you anywhere in the world provides you with the same goodness. Bael or Bilva's fruit is used since ancient time for the treatment of diarrhea, dysentery and gastrointestinal disorders because of its considerable medicinal value. Bael fruit has strong digestive and carminative properties and is rich in nutrients. It helps heal ulcerated intestinal surfaces. Bael has antiviral, anthelmintic and anti-inflammatory properties which work against intestinal pathogenic organisms. It helps to recover faster from bacterial or even viral gastroenteritis or the ‘stomach flu’. 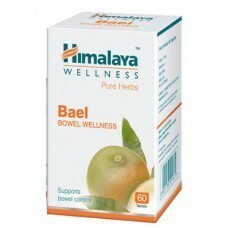 Bael has antispasmodic and anthelmintic properties which ensure optimum gut functioning and it reduces the frequency of bowel movements and calms intestinal spasms and pain. One tablet, twice a day, after meals. 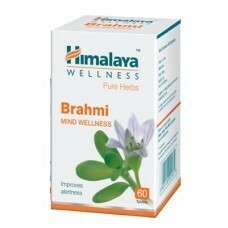 Himalaya Brahmi (Bacopa Monnieri) is a dietary supplement that promotes alertness and supports overall brain. It is a nervine tonic that helps to keep the brain healthy, maintains normal functions, enhances learning, academic performance and improves mental ability. It acts as an anti-anxiety agent and is used in several mental disorders. Brahmi calms restlessness in children, helps to increase the memory and concentration. Tribulus or Gokshura is most often used for urinary genital support. It is also a strong herb for low libido and most highly it used as uro-genital tonic . In the last decade, it has turn into popular to improve sports performance too. Tribulus has been extensively used for dysfunctionin both; males and females. In China and India , the herb Tribulus terrestris has been touted as liver, kidney, urinary, and cardiovascular remedies. In Ayurvedic science, the herb is considered to be a general health tonic and urinary tract disinfectant. In Ayurveda Guduchi (Tinospora cordifolia) is part of the Rasayanas (traditional rejuvenators and important daily tonics). It is used since ancient times as an excellent immuno-stimulant and as a booster for the immune system. It protects very effective the white blood cells like macrophages and helps to improves the body's resistance to infections. It is very beneficial for individuals undergoing cancer treatment. 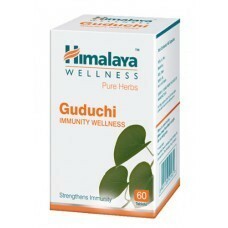 Guduchi possesses antibacterial, anti-inflammatory, anti-rheumatic, and anti-allergic properties. Due to this it is useful in treating inflammatory joint conditions such as arthritis and goat. Guduchi is an excellent general liver restorative and helps in conditions such as alcohol, medical or chemical poisoning. It works as a hepato-protective and is known for stimulating the liver functions. In traditional ayurvedic practices Guduchi has been used in cases of fever, urinary disorders and urinary tract infections. It is very useful as diuretic and helps to remove urinary stones. Apart from this Guduchi reduces anxiety and stress, is useful for the treatment of allergies and is helpful for skin diseases like eczema or psoriasis. 1 capsule twice daily after meals. Allow several weeks for long lasting benefits. Natural products treat not just the symptoms but the body as a whole and take time for absorption and results. Allow several weeks for benefits. The use of natural products provides progressive but long-lasting results. Karela - also known as Bitter Melon - is an ayurvedic key herb used as an adjuvant for the treatment of diabetis mellitus. Bitter Melon helps to achieve a positive sugar regulating effect by suppressing the neural response to sweet taste stimuli. It helps to regulate blood sugar levels and using it over a long period of time it significantly reduces glucose levels in the blood and urine. Bitter Melon is rich in vitamins B1, B2, B3, C and contains potassium, calcium, iron and beta-carotene and workss as an excellent blood purifier. It treats worm infestations, stimulates pancreas and liver and it is very useful in normalizing the digestive tract and also helps in improving peristaltic movements in the body. 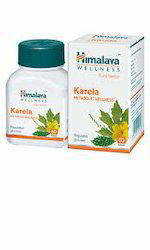 Karela supports the immune-system and keeps body functions operating normally. The chromatograph is representative of the quality and consistency of the drug. Every single capsule of Himalaya Pure Herbs has identical chromatographs, indicative of highest standards of quality maintained by Himalaya Herbals. The pure herb bought by you anywhere in the world provides you with the same goodness. Garlic is well known as a culinary spice. It has been used in many cultures for thousands of years. It contains vitamin C, B6, magnesium, potassium, calcium, selenium, flavonoids and sulfoxide that is responsible for its distinctive taste and odor. 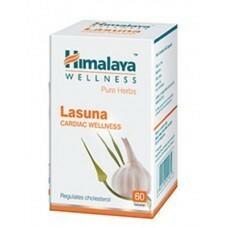 Himalaya Lasuna (Allium Sativum) is a pure extract of Garlic. In Ayurveda Lasuna/Garlic is used for its bacterial and fungal properties. It is helpful in lowering the blood pressure and helps to mantain healthy cholersterol levels. Beside of this Lasuna (Garlic) is used as a carminative, , expectorant, and stimulant. It has the ability to reduce formation of carcinogenic compounds and reduces the risk of esophageal, stomach, and colon cancer when used regularly. It is useful in the treatment of various skin disorderss as acne, pimples and minor skin infections. 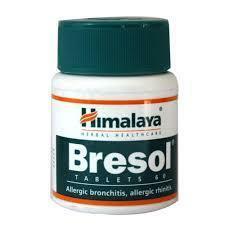 Bresol is a breathing solution for treating chronic respiratory allergies. It's composed of three key herbs like Haridra, Tulasi and Vasaka that work in conjunction to provide relief from respiratory allergies. The anti-inflammatory properties of Haridra help in effectively combating allergies, Tulasi helps promote optimum respiratory comfort by reducing the symptoms of allergy, while Vasaka normalizes the lung function. Extensive research of over 10 years has gone into the development of Bresol. There is adequate research data indicating that it helps to reduce symptoms of allergic rhinitis such as nasal congestion, post-nasal drip, and itching of eyes and nose. The drug is also useful as an adjuvant therapy in asthma as it reduces the asthma score and eosinophil count, thereby improving lung function tests. Many health conditions are now understood to be stress related and coping with the consequences of stress is fast becoming a cornerstone of health and well-being. Geriforte is a completely natural product that regulates and balances all of the body's organs and systems for comprehensive health maintenance. This ultimate general wellness product helps everyone handle daily stress without any adverse effects. Geriforte provides several vitamins and minerals, including vitamin C, from natural sources. It has strong antioxidant properties, the key to its anti-ageing benefits, and improves hormonal effectiveness, the key to its menopausal benefits. It delivers an extremely broad range of health benefits which are well documented by extensive research. Many studies have uncovered definite evidence of Geriforte's effectiveness in stress-related conditions like premature ageing, fatigue, insomnia or emotional imbalance. 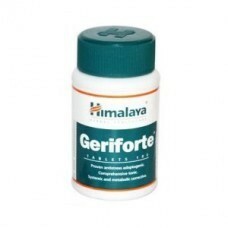 Geriforte is the ultimate physical and mental restorative that keeps the body mentally alert and physically fit. It is the prime example of the elaborate science of using herbs as rejuvenating tonics. Mentat is a unique all-natural multi-ingredient formula that promotes brain health. It is safe and gentle and assists the brain with cognitive tasks and functions. It supports the natural ability of the healthy brain and nervous system to readily store and recall information. It is also a calmative and provides a relaxed feeling. Mentat supports brain function in normal and demanding situations of life. The benefits of taking Mentat daily have been demonstrated in a broad range of cases. Mentat is beneficial to both adults and children. 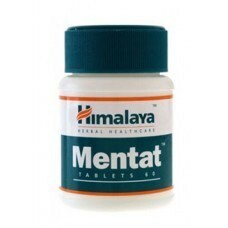 Mentat is a natural and safe calming product. 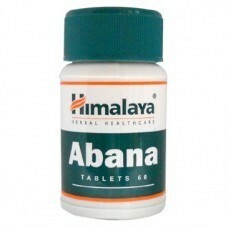 Abana is a herbal ayurvedic formulation from the renowned Himalaya Herbals company. Abana promotes heart health and cardio-vascular functions. It promotes healthy heart muscle energy and helps reduce platelet aggregation. Abana also helps to maintain normal cholesterol levels and normal lipid metabolism. It also helps to reduce nervousness and anxiety. As a daily supplement Abana can be taken to maintain a healthy heart. It can be very beneficial to those who are stressed, smoke, are overweight, or consume high-fat diets. Generally 2-3 tablets, twice daily best taken with warm water. Please consult your physician to prescribe the dosage that best suits your condition. Natural products treat not just the symptoms but the body as a whole and take time for absorption and results. 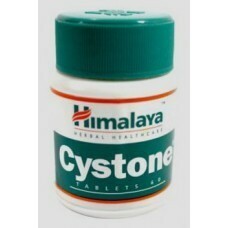 Cystone is an ayurvedic formulation of herbs and minerals. Cystone naturally promotes a healthy urinary tract and helps maintain normal urine composition and mucosal integrity. It is a natural aid in maintaining healthy water management and relieves temporary water - weight gain. As a dietary supplement Cystone assists the kidneys and urinary tract in normal functions. It provides normal absorption and utilization for an overall healthy urinary tract. Cystone prevents supersaturation of lithogenic substances, inhibits oxamide absorption from the intestine and maintains the crystalloid-colloid balance. Take 2 tablets twice daily with meals. May be increased to 2 tablets three times daily, if required. Evecare is a unique proprietary herbal formula which helps women cope with the occasional discomfort associated with their menstrual cycle. It promotes physical and emotional comfort and helps with occasional mood swings, irritability and frustration often reported by women. 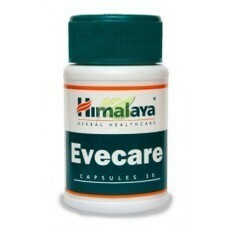 Evecare is an aid to women's health, it helps with normal hormone utilization for optimum hormonal balance. Menstrim also assists normally functioning reproductive system, supports a more even emotional outlook and an optimum sense of well-being. 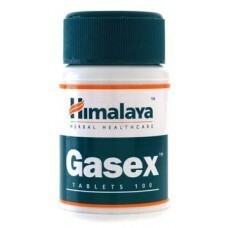 Gasex is an ayurvedic formulation that is known to be helpful in expelling digestive gas. The ashes of shells is used in Ayurveda since ancient times for various beneficial purposes. Gasex contains the ashes of two shells for its digestive properties and for its high content on minerals. One is purified conch shell ashes of silicate magnesium and the other is the shell of Cyprea moneta, a marine species whose ashes contain various salts, phosphate, carbonate and fluoride of calcium, sodium, magnesium and manganese. 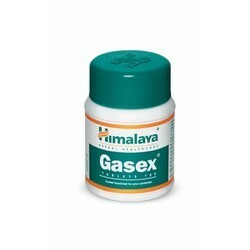 The ingredients of Gasex help in digestion by exerting carminative, antispasmodic, antiflatulent and antacid actions. Gasex is helpful in correcting the disturbed digestive process and functions and it helps alleviate bloating and relieves upset stomach and occasional heartburn and acidity. Gasex ensures that the digestive process efficiently converts ingested food into final products. It is especially effective for the relief from abdominal discomfort in the post-operative period and during prolonged immobilization. 1 to 2 tablets before dinner or when needed. Haridra or Turmeric has many medicinal properties and is commonly used as a spice in Indian cooking. 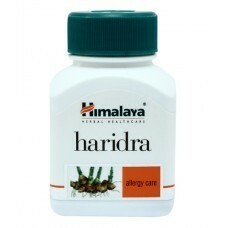 Haridra has anti-inflammatory properties which help in effectively combating allergies. It helps heal wounds more quickly and also possesses blood purifying properties. It also acts as a carminative, stomachic, appetizer and tonic. Allergic skin disorders. Allergic respiratory disorders such as allergic rhinitis and allergic bronchitis. 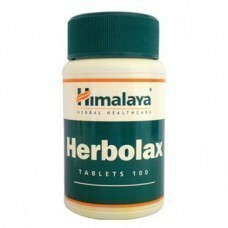 Herbolax from Himalaya Herbals is a herbal ayurvedic formulation that promotes smooth evacuation of stools without disturbing the body's fluid and electrolyte balance. It facilitates normal bowel movements and bowel regularity and helps to relieve occassional constipation. It is safe andnon-habit forming. Occasional constipation can be caused by a number of factors including diet, hormonal changes, medications and pregnancy. Drinking plenty of water and including fruits and vegetables in the diet help to maintain normal bowel movements. The use of herbs for promoting healthy regular bowel movements and routine waste elimination has been prevalent for centuries. Two tablets to be taken with warm water one hour before retiring. The dosage may be increased to three tablets in cases of severe constipation. Prolonged usage is safe, as it is not habit-forming. It is also safe during pregnancy. The Kapikachhu is well known for being both a very effective nervine tonic and , shown to increase levels. 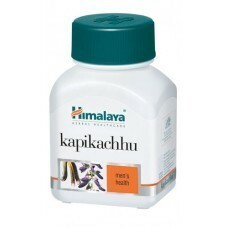 Also many people take Kapikachhu to help maintain the optimum performance of the nervous system. The Kapikachhu is also used as a dietary supplement and helps the deposition of protein in muscles and can increase muscle mass and strength. The extract is also known to enhance mental alertness and improve coordination. In terms of Ayurveda, Manjishtha from Himalaya is one of the most effective herbs that are used for skin care. Actually, the herb Manjishtha acts as a blood purifier. It helps in removing toxins out of your bloodstream and thus out of your body. These herbal capsules are known to be useful in terms of many diseases such as skin infections, raised uric acid and glandular swelling. This herbal skin care remedy is also useful for recovering from ulcers as well as chronic wounds. 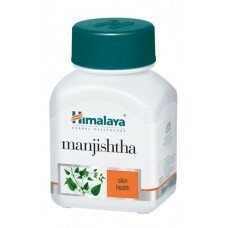 Himalaya Manjishtha has a reputation of being a very good skin care herb. You can use it internally as well as externally and helps an individual gain luster and glow in terms of his/her skin and at the same time aids in to remove discoloration, pimples and freckles. This herbal skin care remedy is highly recommended in Ayurveda as a medicine for skin diseases especially associated with edema and oozing. Plays an important role so as to improve the functionality of the lymphatic system that helps in draining wastes from your body and at the same time controls and regulates your immune system. 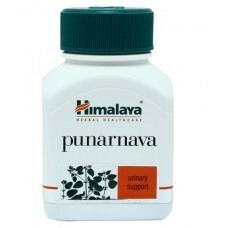 The extract of Punarnava has diuretic properties. It helps maintain effective kidney function. Punarnava helps maintain efficient kidney function, with its diuretic, antispasmodic and anti-inflammatory action. It is a very useful herb in treating edema. Urinary tract infections. Edema (swelling). 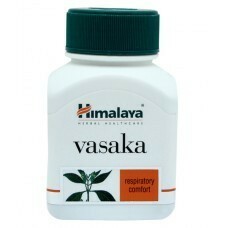 Vasaka is a well-known herb in indigenous systems of medicine for its beneficial effects, particularly in bronchitis. This herb is extensively used for treating cold, cough, chronic bronchitis and asthma. A unique herb that helps support the bronchial function with broncho-dilatory, expectorant and properties. It normalizes lung function. Arjun herb has been used in Ayurveda since 2500 BC as a cardiac tonic. Various medical experts raved about Arjuna in the Health Sciences Institute newsletter "Once in a blue moon, we uncover a supplement that does so many things well, it is hard even for us to believe it is real." It also mentions many clinical studies conducted on Arjuna which have confirmed its numerous therapeutic cardiac benefits. 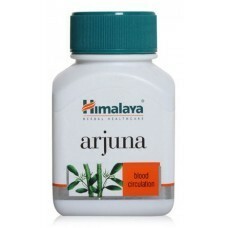 Arjuna herb helps to maintain healthy cardiovascular functions and also promotes normal cholesterol levels. Arjuna bark powder contains the co-enzyme Q-10 that is extremely beneficial for strong heart muscles. 1 or 2 capsules with meals. Allow several weeks for long lasting benefits. Natural products treat not just the symptoms but the body as a whole and take time for absorption and results. Ashwagandha has been used in Ayurveda for more than 2500 years to treat inflammation, fever, boost the immune system, improve memory and promote overall wellness. Ashwagandha is a mood stabilizer. It assists the body's ability to maintain physical effort and helps the body to relief occasional stress, fatigue and sleeplessness. It normalizes the depressed state of mind and it is a good supplement for mental health. It is especially beneficial in stress related disorders such as arthritis, hypertension, diabetes, general debility, etc. 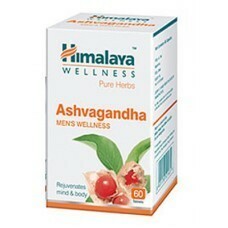 Ashwagandha is a powerful antioxidant which eleminates free radicals in cells that are responsible for premature aging. It is a well known . The chromatograph is representative of the quality and consistency of the drrug. Every single capsule of Himalaya Pure Herbs has identical chromatographs, indicative of highest standards of quality maintained by Himalaya. 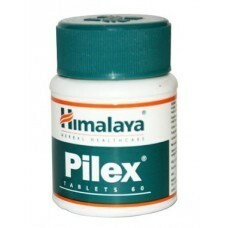 Pilex tablets reduces the engorgement and turgidity of the veins and venous capillaries. By relieving hepatic congestion and portal pressure, Pilex tablet plays a facilitatory role in hepatic disorders associated with venous congestion. The anti-inflammatory and anti-infective actions reduce inflammation, check infection and promote healing. 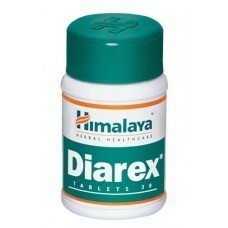 The laxative property of Pilex tablet corrects chronic constipation associated with hemorrhoids. Pilex is useful in case of the following symptoms. Purim's antiseptic, antibacterial, antifungal, anti-inflammatory, antiviral, wound healing and anti-allergic properties work synergistically to treat skin infections. As a hepatostimulant, the drug improves liver function and its detoxifying property removes toxic metabolic products from the body. 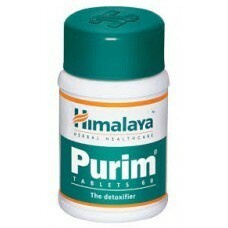 Purim provides symptomatic relief in skin allergies and dermatitis. Neem (Nimba) is a revered herb in Ayurveda. It is helpful for the treatment of skin disorders, due to its detoxifying property. The growth of acne-causing bacteria such as propionibacterium acnes (P. acnes) and Staphylococcus epidermidis is also inhibited by Neem. The role of Neem in acne is further supported by studies, which have shown that it exhibits anti-inflammatory activity by suppressing P. acnes-induced reactive oxygen species (ROS) and the pro-inflammatory cytokines TNF-a and IL-8. Septilin provides effective support of the immune function, ensuring that the immune response works efficiently. Septilin possesses immunomodulatory and anti-inflammatory properties, which potentiate the non-specific immune responses of the body. 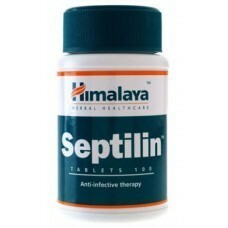 Septilin builds up resistance to infection and helps prevent re-infection. Septilin's stimulatory effect on the humoral immunity increases the antibody-forming cells, thereby enhances the secretion of antibodies into the circulation. Septilin also augments the synthesis of erythropoietic and granulopoietic precursor cells, stab cells and primary myelocytes. - Yashti-Madhu / Licorice (Glycyrrhiza glabra) 12 mg. If you have bleeding gums, bleeding hemorrhoids, epistaxis, abnormal uterine bleeding or spotting Himalaya Styplon is there to help you. 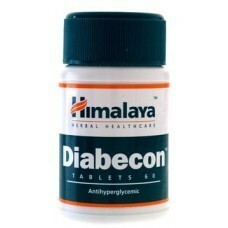 Himalaya Styplon is composed of natural and absolutely safe herbals having a wide range of effects. 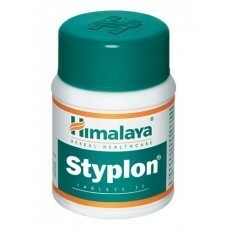 Himalaya Styplon facilitates hemostasis through its active components and thus helps to control bleeding. Vrikshamla or Garcinia fruit is used for preparing cooling syrups during the summer months. The extracts of fruit help in keeping slim and trim. The fruit is known to reduce conversion and accumulation of fat in the body & to reduce weight. Vrikshamla is helpful in weight management. Himalaya Talekt, a phytopharmaceutical formulation, is recommended for various skin disorders such as disorders of sebaceous glands, bacterial infections of skin, infective and allergic dermatitis, systemic mycoses, parasitic infections, and psoriasis. 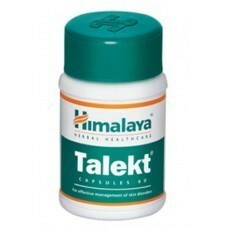 Talekt enhances the immune response to prevent repeated relapses. Talekt is safe for short- and long-term treatment. 2 Capsules twice daily or as directed by your physician. 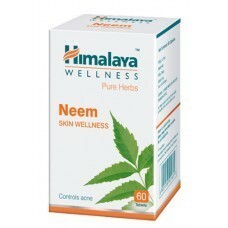 Looking for Himalaya Herbals ?